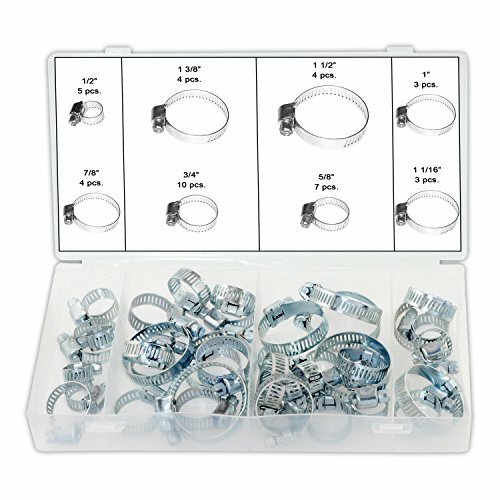 This 40 pc hose clamp assortment includes most popular sizes of hose clamps. The clamps are made from zinc plated steel construction and tighten evenly with worm gear drive. Ideal for plumbing, automotive and mechanical applications. The assortment incudes 5 pc 1/2", 7 pc 5/8", 10 pc 3/4", 4 pc 7/8", 3 pc 1", 3 pc 1 1/16", 4 pc 1 3/8" and 4 pc 1 1/2". Assortment includes: 5 pc 1/2", 7 pc 5/8", 10 pc 3/4", 4 pc 7/8", 3 pc 1", 3 pc 1 1/16", 4 pc 1 3/8" and 4 pc 1 1/2"
If you have any questions about this product by Ansen Tools, contact us by completing and submitting the form below. If you are looking for a specif part number, please include it with your message.